Programme of Mystery Delights Bradford Friends. A large gathering of friends and visitors enjoyed an entertainment full of mystery and dexterity at the Somerset Parlour last night, when the Yorkshire Society of Magicians held their fifth annual seance. Delighted with the opportunity of being able to catch this elusive society “at home,” a large company turned up, and for some thing like two and a half hours witnessed startling feats which made one wonder why the members of this mysterious society troubled to earn their living in the ways of ordinary men. 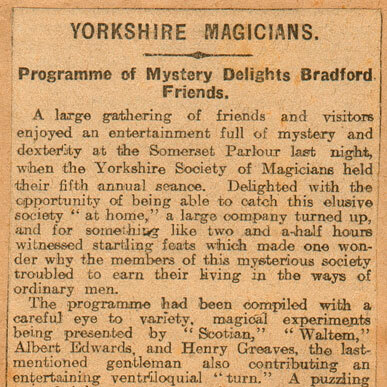 The programme had been compiled with a careful eye to variety, magical experiments being presented by “Scotian,” “Waltom,” Albert Edwards, and Henry Greaves, the last mentioned gentleman also contributing an entertaining ventriloquial turn. A puzzling second-sight act was contributed by Professor Baker, assisted by his daughter “Zina,” and Mr. H. Bradley (tenor) ably rendered a number of songs. The proverbial quickness of the hand was much to the fore at the Bradford: Y.M.C.A. last evening, when the Yorkshire Society of Magicians held a meeting, under the chairmanship of Mr. A Feather. The object of the Society is mutual help among the devotees of the black art, and some of the younger members particularly found one or two of the demonstrations that things are not always what they seem very interesting. Mr. Feather was entertaining the troops in France and Belgium for eighteen months during the war, and as everybody knows adds amusing ventriloquism to his other accomplishments.